Goa is one of the most visited states in India, with two-wheelers contributing significantly to the growth of local tourism. Renting a bike to explore the roads of the state is extremely popular, with 69% of all vehicles in Goa being two-wheelers (as per data released by the economic survey of Goa). A good percentage of these two-wheelers are rented out to tourists, making insurance even more important. The state has a poor record when it comes to accidents, with 300 accidents registered on an average each month. Two-wheelers account for a majority of these accidents, with close to 25 fatalities every month. All these factors highlight the need for a good bike insurance policy, helping not just tourists, but also owners of these vehicles. The aforementioned names are not listed in any particular order. Finding a garage in Goa can often be hard, especially when one is out exploring the state. Insurance providers tie up with garages to eliminate the hassle associated with fixing a bike after it is involved in an accident. This can be a boon to owners of the bike, especially since minor accidents involving rental bikes are extremely common. Individuals who are unable to come across a cashless garage on their route can find one easily, by utilising any of the listed means. Search for the nearest network garage using the official website of the insurer. Most insurers have a feature which can be utilised to get a list of the garages they have a tie-up with. One could search the sales brochure of the insurance policy. Certain insurance providers could provide this information in the brochure. One could call the customer care number of the insurance provider and request them to provide details of a network garage. One could approach the branch of the insurer/contact a sales agent and get the information through them. Getting a vehicle repaired at a cashless garage in Goa can be beneficial in a number of ways. Ease of use – Utilising the services of a cashless garage is simple, with minimal paperwork required. One can give the bike for repair after informing the insurer, with all additional work done by the insurer directly. Limited search – Finding a good garage in Goa can be hard, especially during an emergency. Insurance companies tie-up with garages to provide services which do not require one to travel across the state in order to find a garage. Experts – These garages specialise in servicing two-wheelers. A number of garages in the state might not be adept at handling bikes of different makes and models. Faster – It is possible to get the vehicle repaired faster, when compared to a regular garage. This is primarily due to the link shared between the insurer and the garage. Quality service – One aspect most of us worry about while getting a bike fixed is the quality of parts used. Small garages could use duplicate spare parts, compromising on the safety of the bike. This, however, is not the case with network garages. One can be rest assured that genuine products and quality servicing is done. Affordable – The bill is settled by the insurer directly, with the policyholder not required to be present for the same. This helps one utilise their time efficiently. Additionally, out-of-pocket payment is minimal and is required only in cases where the cost of damage exceeds the cover provided. Replacement vehicle – Individuals can request for a replacement vehicle while their bike gets fixed at a network garage. Additional services – Most network garages offer additional services to improve the overall process. These include towing, roadside assistance, etc. A bike insurance is not merely a necessity, it is also an investment on the bike. With a host of options available in the market, one could get confused when it comes to choosing a policy. Keeping these simple points in mind can help ease the process, helping one find a policy which meets their needs. Policy type – A third-party liability cover is mandatory for all two-wheelers in the country. This cover is essentially designed to protect the interests of anyone who is injured by the insured vehicle. This provides a basic level of protection and might not be the ideal option for those looking for comprehensive cover. Alternately, one can opt for a comprehensive policy to get additional cover. 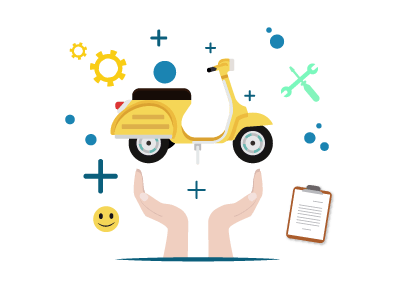 Policy term – A typical two-wheeler insurance plan comes with a term of 1 year. These are annually renewable policies. One can alternately choose a longer period, with certain insurers providing cover for 2/3 years. Policy inclusions – Each policy comes with a list of inclusions and exclusions. Choosing a policy which has more inclusions is a smarter option, for one is protected against more possibilities. Premium – It is a smart option to compare the premium charged by different insurers. The premium amount depends on a number of factors, including the model and make of bike, condition of vehicle, etc. Opting for a longer period can help lower the premium amount, making it a smarter option. Discounts – Insurers offer discount in the form of No-Claim Bonus (NCB). Not making a claim increases the NCB, resulting in lower premium. Claims process – Choose an insurer who has a dedicated claims settlement team in place. This helps reduce any stress and anxiety which is typically faced when one files a claim. Transferring ownership of the bike insurance policy is imperative when one sells the vehicle to someone. Failing to do this could result in the policy becoming null and void, with the insurer having the power to reject any claim. Individuals who have sold their vehicle to an individual from a different state can transfer ownership of the policy by following a few simple steps. Inform the insurance provider about the sale of bike. Submit documents pertaining the sale to the insurance provider. These include the NOC from the regional transport office, the registration certificate, sale deed (if any), etc. State the need to transfer ownership of existing policy to the new owner of the vehicle. The insurer will transfer the policy after examining the documents. The new owner should meet the basic criteria mentioned by them (if any). The original owner of the policy should transfer the NCB in his/her name to enjoy the benefits accorded by it.